I woke at dawn on the holiday, so my grandmother put me to work polishing Mama’s army boots. “Try not to let her see them,” Nana warned me. I already knew. I took the boots to the bathroom with an old sock and the polish kit. I had seen Nana clean them before, but this marked the first time I was allowed to do it myself. Saddle soap first, then moisturizer, then polish. I pictured Nana at the ironing board in our bedroom, pressing the proper creases into Mama’s old uniform. The door swung open, and I realized too late that I had forgotten to lock it. Mama didn’t often wake up this early on days she didn’t have to work. “Whose are those?” my mother asked, yawning. “Uh—” I didn’t know what to say, which lie I was supposed to tell. Mama’s gaze lingered on the boots for a moment. Did she think they were the wrong size for Grandpa? Did she recognize them? I pinched the boots together and lifted them away from my body so I wouldn’t stain my clothes, gathering up the polish kit with my other hand. Mama waited until I slipped past before she wheeled in. Her indoor chair was narrow, but not narrow enough for both of us to fit in the small bathroom. “I’m sorry,” I whispered to Nana once the door closed. “No harm done,” Nana whispered back. I finished on the kitchen floor, now that there was no reason to hide. It was almost time, anyway. The parade would start at ten by us. In some places, people had to get up in the middle of the night. Mama came in to breakfast, and I put the boots in a corner to dry. Nana had made coffee and scrambled eggs with green chiles, but all I could smell was the saddle soap on my hands. We all ate in silence: Mama because she wasn’t a morning person, and Nana and I because we were waiting. Listening. At eight the sirens went off, just the expected short burst to warn us the Veil would be lifting. The lifting of the Veil always hit her the same. My teacher said each vet reacted in a different way, but my friends never discussed what it was like for their parents. Mama always went “Oh” first, lifting her hand to her mouth. Her eyes flew open as if they were opening for the first time, and for one moment she would look at me as if I were a stranger. It upset me when I was little. I think I understand now, or anyway I’m used to it. She studied her hands in her lap for a moment, and I saw they were shaking. She didn’t say anything, just wheeled herself into the bathroom. I heard the water start up, then the creak as she transferred herself to the seat in the shower. Nana came around the table to hug me. When she got up to lay Mama’s uniform on her bed, I followed with the boots I had shined. We waited in the kitchen. Showering and dressing took her a while, as it did on any day, but when she appeared in the kitchen doorway again, she had her uniform on. It fit perfectly. Mama didn’t need to know that Nana had let it out a little. I had never seen a picture of her as a young soldier, but it wasn’t hard to imagine. I only had to strip away the chair and the burn on her face. This was the one day I looked at her that way; on all other days, those were just part of her. “Did you shine these for me?” She pointed to her boots. “They’re perfect. Everyone will be so impressed.” She pulled me onto her lap. I was getting too old for laps, but today she was allowed. I stayed for a minute then stood again. When she laughed it was a different laugh from the rest of the year, a little lower and softer. I’ve never been sure which is her real laugh. At nine, we all got in the van, and Mama drove us downtown. “Mama, no! This is for you!” I didn’t understand why she would suggest such a thing. My horror welled up before I thought to see what Nana said first. She turned to Nana next, but my grandmother just shrugged. “You’re right, Clara. I don’t know what I was thinking.” Mama sighed and put the van back into gear. Veterans got all the good parking in the city on the holiday. Mama’s uniform got us close. The wheelchair sticker got us even closer. I didn’t understand how they all knew where to go, how to find their regiments, but they did. Nana and I stood near the staging area and watched as the veterans hugged each other and cried. Mama pointed to me and waved. I smiled and waved back. We found seats in the grandstand, surrounded by other families like ours. I recognized a couple of the kids. We had played together beneath the stands when we were little, when we called it Remembery Day because we didn’t know better. Now that I was old enough to understand a little more, I wanted to sit with Nana. The metal bench burned my legs even through my pants. A breeze blew through the canyon created by the buildings. It rustled the flags on the opposite side of the street, and I tried to identify the different states and countries. A marching band started to play, and we all sang “The Ones Who Made it Home” and then “Flowers Bloom Where You Fell.” At school I learned that parades used to include national anthems, but since the War our allies everywhere choose to sing these two songs. I can sing them both in four different languages. The band stopped in front of each stand to play the two songs again. It was always a long parade. Behind them came six horses the color of Mama’s boots and every bit as shiny. Froth flew from their mouths as they tossed their heads and danced sideways against their harnesses. Their bits and bridles gleamed with polish, but they pulled a plain cart. It rolled on wooden wheels and carried a wooden casket. The young man driving wore the new uniform designed after the War, light gray with black bands around the arms. Nobody who hadn’t fought was allowed to wear the old one anymore. Then came the veterans. Fewer every year. Nana has promised me Mama was never exposed to the worst stuff; I worry anyway. I imagine there will be a time when there aren’t enough of them to form ranks, but for now there were still a good number. Some, like my mother, rode in motorized wheelchairs. Some had faces more scarred than hers. Others waved prosthetic hands. Those too weak were pushed by others or rode on floats down the boulevard. I saw my teacher march past. I had never noticed him in the ranks before, but I guess he wasn’t my teacher until this year, so I wouldn’t have known to look for him. The way he talked in class I would never have guessed he was a veteran. Of course, that was the case with all of them since the Veil was invented. I don’t know why I was surprised. When Mama passed I mustered a little extra volume, so everyone would know she was mine. She spotted me in the crowd and pointed and waved. We cheered until our throats were raw. It was the least we could do, the only thing we could do. The same thing was happening at the same time in all the cities and countries left. I pictured children and grandparents cheering under dark skies and noonday sun. It was summer here, but winter in the northern hemisphere, so I pictured the other kids bundled up, their bleachers chilling their legs while the bench I sat on made me sweat behind my knees. The last soldiers passed us, and we made sure we had enough voice left to show our appreciation to them as well. Behind them, another horse, saddled but riderless, with fireweed braided into his mane. He was there to remind us of the clean-up crews, those who had been exposed after the treaty. None of them were left to march. We waited in the stands after the parade ended. Nana spoke with some people sitting nearby. Some families left, but others lingered like us. We knew it would be a while. The veterans had gone off to gather at their arranged meeting places as they were supposed to do, in bars or parks or coffee shops at the other end of the route. A couple of people in uniform walked back in our direction and slipped away with family, ignoring the looks we gave them. We all knew they were supposed to be at the vote. “What do you think they’ll decide this year?” asked a boy around my age. I had met him before, but I didn’t remember his name, only that both his parents were in the parade. He sat alone. He moved away from me. Nana was still talking. The bench had cleared and I lay back on it despite the heat. We were lucky to have had such beautiful weather. The sky was a shade of blue that got deeper the more I looked at it, like I could see through the atmosphere and into space. I thought about the other girls like me in a hundred other cities, waiting for their mothers and lying on benches and looking up at the sky. We waited a long time. Nana pulled out her book. Her finger didn’t move across the page the way it usually did, so I guessed she wasn’t really reading. I closed my eyes and listened to the sweepers come to clear the streets, and the other stragglers chatting with each other. Now and again the bleachers clanged and shook as small children chased each other up and down. Eventually, I heard the whine of a wheelchair operating at its highest speed. I shaded my face and looked down. Mama. Her eyes were puffy like she had been crying. Some years she smelled like beer, but this year she didn’t. I sat in the backseat and counted all the flags hanging from houses and shops. “And?” Nana asked after we had ridden in silence for several minutes. Back at the house, we took in the flag. Mama changed her clothes. She sat in her recliner with her hands folded in her lap, while Nana took the uniform from her to hide until next year. I went to get my father’s photo from my drawer. I didn’t see Nana on the other bed until I stood up. She was holding her face in her hands. “I think the good memories hurt too.” I had seen the tears in my mother’s eyes. “Tell me something about him that I don’t know.” I climbed onto the arm of the recliner. My mother smiled and took the photo from me, tracing his jawline and then the buttons on his dress uniform. “The first week we were there, he brought chalk with him. He said there was one little boy, and he went to give him a piece of chalk, and suddenly he had two dozen children climbing all over him with their hands out. He was lucky it was chalk, so he was able to break it into smaller pieces. Some of the little ones tried to eat it. ‘At least they got their calcium,’ he told me later. After that, he didn’t bring them anything, since he didn’t have anything else to split so many ways. He made me teach him hopscotch, so he could teach it to them. Can you imagine that? This big soldier playing hopscotch? Then four square, football, anything they could play with a stick or a line in the dirt or the ball they already had. He would sneak back in with his eyes glowing like he had forgotten where we were and why we were there. Then the first attack—” She twisted her hands in her lap. A church bell began to chime, and another one, and another. There was so much I wanted to know. A tear rolled down her cheek, and she pulled me close. She didn’t answer, and I knew it was too late. I thought of my father, the man in the uniform, and tried to picture him teaching hopscotch to me instead of village children. It was hard to imagine somebody I had never known, never could know. I should have started with her instead of my father. Minutes passed, and the bells stopped. Mama’s face closed down like a shutter. She fumbled in the pocket on the side of her chair. The photo of my father slid off her lap and to the floor. “Sure. I’ll be right back.” I picked up the fallen photograph. “Who’s that?” she asked, glancing up. Nana was asleep on her bed. I hid the photo back in my drawer where Mama couldn’t reach it or find it accidentally. Why had I asked about him first? I could never know him. He was gone and she was here and I still didn’t know any more about the parts of her that went away. I pulled a chair up beside Mama’s and leaned up against her. She leaned back. This was the Mama I knew best. The one who couldn’t quite remember why she was in a wheelchair, who thought war was something that had happened to other people. The one who laughed at pet videos with me. Some year, maybe the old soldiers would vote to lift the Veil. Maybe I’d get to know the other Mama, too: the one who remembered my father, who had died before I was born. The one who could someday tell me whether it had been worth everything she had lost. Next year, I would try to remember to ask that question first. 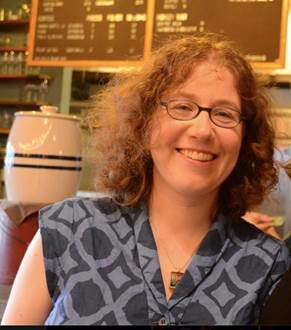 Sarah Pinsker is the author of the novelette “In Joy, Knowing the Abyss Behind,” winner of the 2014 Sturgeon Award and 2013 Nebula Award finalist, and 2014 Nebula finalist, “A Stretch of Highway Two Lanes Wide.” Her fiction has appeared in Asimov’s, Strange Horizons, Fantasy & Science Fiction, and Lightspeed, and in anthologies including Long Hidden, Fierce Family, and The Future Embodied. She is also a singer/songwriter and has toured nationally behind three albums; a fourth is forthcoming. In the best of all timelines, she lives with her wife and dog in Baltimore, Maryland. She can be found online at sarahpinsker.com and on twitter @sarahpinsker. This is what it’s like for military families when we want to know about our loved one and there is an entire area of their life they can’t or won’t talk about. No benefit of the Veil in real life for them. Great story. Very nice indeed, well done. A lovely story with exactly the right narrative touch. I’ll be recommending this one to my friends.